Why is spring a good time to plant trees? Although spring is a great time to plant trees, winter is a great time to start planning your spring tree plantings. It is important that you decide the locations you want to plant your trees (http://www.growingearth.com/planting-the-right-tree-in-the-right-location/). This ensures that when spring arrives, you’ll be ready. If you fail to plan for the upcoming planting season, you are sure to face many problems. Any good planter knows spring is the smartest time to plant trees, due to the fact spring planting allows trees to become established sooner, grow more, and prosper better when the warm weather comes. Planting in the spring is even more important when planting bare rootstock. The majority of encapsulated and container-grown stock, as well as burlapped trees, can be planted any other time in the growing season, but greatly benefit from being planted in the spring. Below, you will find many tips to help you become a successful spring tree planter. When in the process of transporting trees, it is important to protect them from large amounts of wind, drying, and rough handling. The planting hole should be dug no less than two feet as wide of the root system. The trees should be planted around an inch higher than the depth of the container they grew in. Pockets of air should be eradicated through the process of watering and packing after the tree has been planted. Fill in the planting hole with a combination of nearby soil, and soil enhancements such as natural material or topsoil. It is important to never directly add fertilizer to the roots. Wait around a year before fertilizing, since the trees need to become fixed into the ground. It is important to remember to cultivate the area around the anchor of a freshly planted tree and mulch. Don’t place plastic under the mulch, and keep it away from the trunk of the tree. 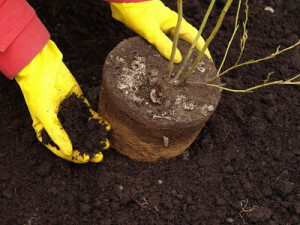 Concerning bare root and packaged trees, take the prune damaged roots, and spread them before adding soil. Softly lift the plant to the accurate depth, as the soil is added. When the hole is near three-quarters full with soil, fill it with water in order to eradicate air pockets, and then deepen soil before watering again. For balled and burlapped trees, raise only by the soil ball, and be cautious not to loosen it. Remove all the twine, pull the burlap away from the trunk of the tree, and ensure no burlap is above the ground after planting. Backfill the hole around three-quarters full, wet the soil ball slowly with water, then complete the hole by filling it with soil. Regarding encapsulated and container-grown trees; set aside all containers at the planting location. Treat containerized roots with care. If container-grown roots are growing in a coil, make vertical cuts on the sides of the soil neighboring the roots, and a crisscross cut on the lowest part to cut nets of roots. Plant as you normally would a balled and burlapped tree. Be sure your trees don’t get infected from insects or diseases during that crucial first part of the year. On tiny trees, caterpillars can be removed by hand. A good shot with a garden hose will assist with controlling aphids or spider mites. Frequent care and observation ensures you of having healthy trees. If you follow the tips mentioned above, you are sure to have one of your most successful planting seasons. Remember, successful planting only comes from proper planning.